It’s one of the most eagerly-awaited movies of the year, and while it won’t be out for awhile, there’s already big expectations. After all, The Hunger Games broke box office records and made a superstar out of Jennifer Lawrence, so it’s unsurprising that the teaser trailer for The Hunger Games: Mockingjay Part 1 has gotten all sorts of attention out there. A splashy San Diego Comic Con debut won’t exactly slow down the hype machine, so let’s catch up to it. The official teaser trailer for The Hunger Games: Mockingjay Part 1 has been released! 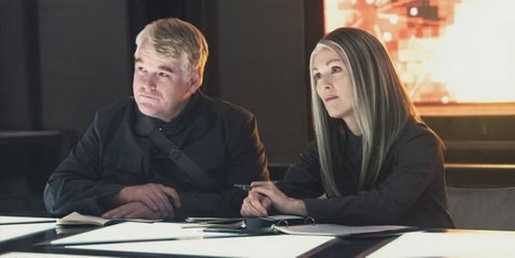 Jennifer Lawrence returns as Katniss Everdeen, this time a pawn in the rebellion started by Plutarch Heavensbee (Philip Seymour Hoffman in one of his last roles) and District 13 leader Alma Coin (Julianne Moore) against evil President Snow (Donald Sutherland) and the rest of the villains of the Capital of Panem. Needless to say, the trailer gives away nothing while making people very, very excited for the next chapter in that particular story.